What is the formula for social media success? I can’t say for sure if your answer is the correct one. But I can guarantee that your answer will be different from mine, and from the other marketers who I pose this question to. This is because best practices, social media trends etc. vary from industry to industry and region to region. In short, the question I ask here is if there are different routes to social media success. 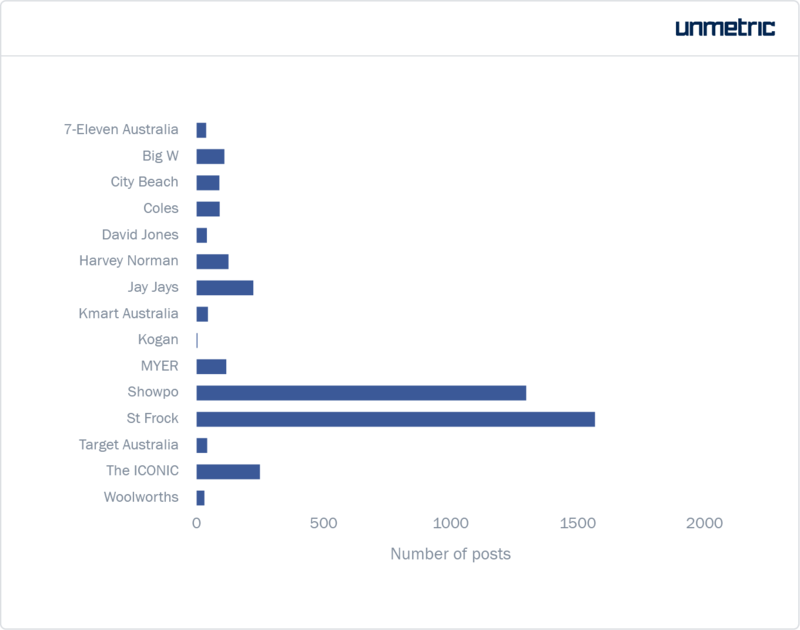 To try and answer this, I analyzed 15 retail brands from Australia on Facebook. They are 7-Eleven Australia, Big W, City Beach, Coles, David Jones, Harvey Norman, Jay Jays, Kmart, Kogan, MYER, Showpo, St. Frock, Target Australia, The Iconic, and Woolworths. Engagement is a good measure of social media success because it measures how your audience responded to your content. Showpo was likely to receive more likes, shares and comments on a single post than any other brand. Woolworths and St. Frock also performed well in this aspect. 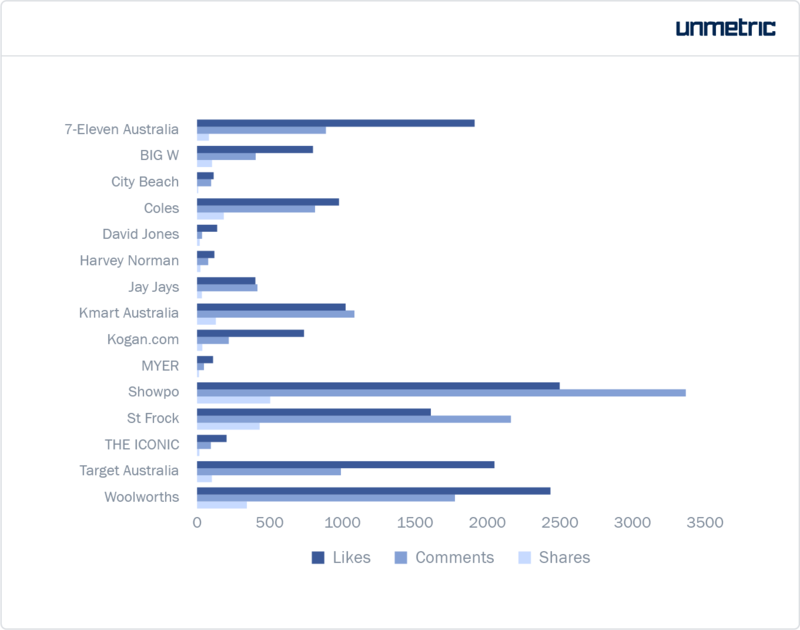 While Woolworths took the lead in average likes, St. Frock got more shares and comments per post. Even in terms of overall engagement, Showpo amassed the most likes and comments while St. Frock had the most shares. But what were the reasons that led to these brands’ exceptional performance? Posting more as a strategy has not paid off for brands, generally speaking. This is because people hate being bombarded with repetitive messages, and the Facebook algorithm responds to that. A constant stream of uninteresting content that is not relevant to your audience can do your brand a lot of harm on social media. However, this doesn’t necessarily mean that you should post over 400 times a month. Especially not without looking at how Showpo and St. Frock command their audience’s attention. Does the secret to engagement lie in publishing more of one content type and less of another? 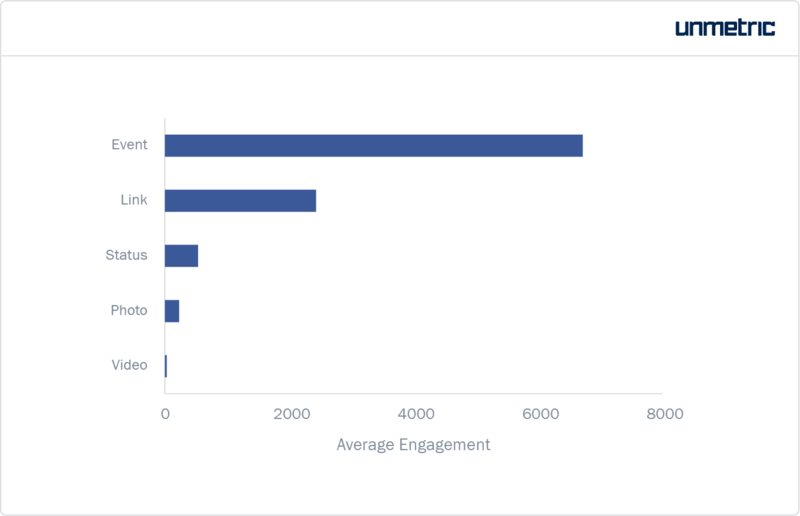 The chart below shows the engagement each type of content brought in, on average. Video outperforms other content types by a large margin on Facebook. Clearly, Showpo and St. Frock publish the most number of videos. And, they get the most engagement out of this content type. 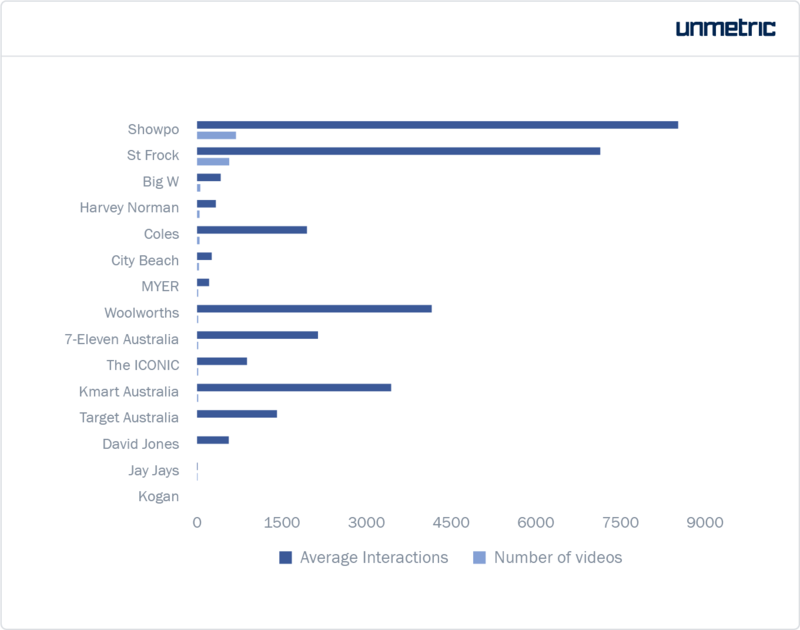 When you consider these brands’ impressive engagement overall, you can’t help but wonder if it is owed to the significant volume of videos they publish. Let’s take a look at some of the most engaging posts from this group to see if video content is the key to engagement. If 9gag and Buzzfeed Tasty has taught us anything, it’s that people love this stuff. And at least some of it requires minimal effort too. Showpo, for instance, sources their memes from publishers like Country Living, Dogsbeingbasic etc. Great! Shall I just do memes, then? This in no way means that all brands should scrap their carefully planned content strategy in favor of short video content inspired by memes. It can definitely be part of your content strategy based on how your audience has responded to similar content – and on your brand positioning. I can’t imagine a luxury or upscale brand using LOLs for engagement! It is also important to have a clear idea of what your priority on social media is. Is publicizing your brand and your products more important for you right now than providing a steady stream of non-brand-related engaging content? For many new brands, this might be the case. It is possible that Showpo, St. Frock and Woolworths might be using dark posts to promote their products. But among the publicly visible posts, brand-centric communication gets drowned in all these fun videos. For instance, the 250 posts by Showpo in which they shared details about their merchandise, stores or sales brought in 307 interactions on average. The overall average is 25 times that. This does not mean that these brands are not getting any ROI out of social media. The kind of content they post projects their personality. This helps in building a dedicated following and brand loyalty. Plus, even though their brand-related communication does not get great engagement, they still get better organic reach because their audience engaged with their other posts. 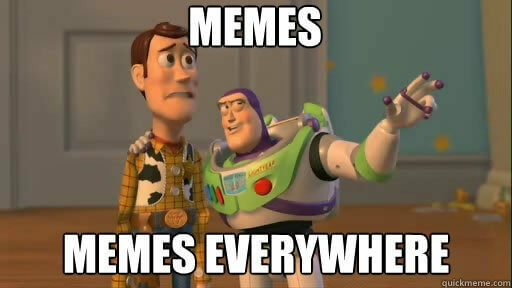 I cannot guarantee that sharing memes on Facebook will bring you engagement. But it is definitely something that you should try and test out, especially if you are a retail brand in Australia. Xia, our AI, can help you do all this with surgical precision. Improve your social media performance with data-driven insights and competitive intelligence. Learn more about it here or sign up for a demo.